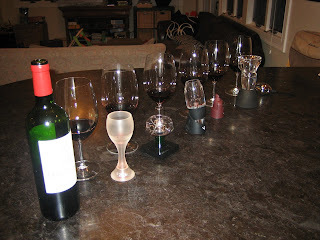 Since I started writing this blog, the most popular entries by far have been wine aerator reviews. I started off reviewing the market-segment-leading Vinturi. From there, I branched out to the Soiree, the Respirer and others. Now, I've got a half-dozen wine aerators with more on the way. It's a very competitive market segment. I strongly believe in blind tasting to test these devices. It sets you free of bias associated with the theatrics associated with each device, and it sets you free of bias associated with past experience with the devices. I used the 2005 Chateau Greysac Bordeaux. I've never had the wine before. Wine Spectator rated it 89 points and it's available at the Wine Cellar of Stoneham for $12.99. A fine wine from a highly rated vintage, I chose it because it was young relative to its ideal drinking window according to James Suckling from Spectator and likely to be tight and have tannins that could stand some softening. Blind tasting is challenging. When you take away the label and the bottle, or in this case the wine aerator and its operational characteristics, the red wine in the glass tends to be more similar than you'd expect. There wasn't a huge level of differentiation in the wines I taste, but groups of preferences emerged. Some seemed average, others were above average and the remaining were below average. Once I had an opinion on my favorite glasses, I spent more time analyzing them to determine a rank-order for the Top 3 wines. These results are just one person's opinion of the performance of these devices on a given night with a given wine. If I tried a different wine tonight, or heck, even the same exact wine I doubt I'd replicate the exact same finish order. I'll have some links at the end of this piece for others who have done similar comparative tastings for you to triangulate and draw conclusions from. My goal here is to provide useful, unbiased, and understandable information that you might be able to use to help decide which wine aerator to purchase. My first assessment was based on aromatics. Wine aerators are supposed to accelerate the natural process of wine combining with air to release aromas. I'm looking for wine to have a higher level of aromatics and further to smell deeper and richer rather than more closed, bitter or unpleasant. My second assessment was based on taste. Specifically at tannins and how I perceive each aerator's ability to soften tannins and deliver a smoother taste and finish. Finally, I re-smelled and re-tasted each wine I liked best based to see which I found most satisfying overall. The results below are my notes as tasted blind, rank ordered in terms of preference. Soiree bottle-top Wine Decanter & Aerator Top pick. Tobacco and earth on the nose. Light plum on the palate. Smooth tannins. Very good. Bold. Present. Deep. Full review HERE. BevWizard Magnetic Wine Aerator, Smoother, Enhancer, Dripless Pourer Top Three. Classic Bordeaux. Tied for best nose with #3 finisher. Full review of this magnet-based device coming soon. Respirer Next Generation Wine Aerator Top Three. Pronounced fruit aromas. Classic Bordeaux pencil lead. Tied with #2 finisher on the nose. Smooth tannins. Nice. Full review HERE. Decantus Slim Wine Aerator Light plum aromas mixed with some iron. Lacked presence. Smooth finish. Average. Full review coming soon. Vinturi Essential Wine Aerator Plum. Some fruit, little else. Smooth tannins. Below average. Full review HERE. Metrokane Rabbit Wine Aerating Pourer Simple fruit. Bitter. Not favorite. Below average. Lacking flavor. Full review coming soon. Unaerated More bitter aromas. Cold blood on pavement/iron. More apparent tannins. Still bitter after some time passed. Bottom three. Honestly, when I turned over the card on my top pick I was surprised to see it was the Soiree. Why was I surprised? Because the aerating nature of some of the other devices are so obvious and the Soiree is more subtle. This marks the second time the Soiree has taken the top spot in a head-to-head blind tasting I've conducted, the first as part of a 4-way vs. Vinturi, a traditional decanter, and a pop 'n pour control. Click HERE to read that review. The BevWizard is an intriguing aerator that combines magnet-based technology with the aeration process. I'll do a complete video review with an interview with its inventor hopefully, Master of Wine Patrick Ferrell, soon. The Respirer is based on a similar operating principle as the Vinturi with some additional usability features. My review of the device has been the most popular page on this site the past few months. Are you a wine aerator manufacturer who would like to send me a sample for review? Have a look at my sample policy and then contact me. Thanks in advance! 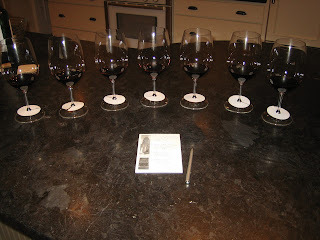 With the exception of the Vinturi, all of the wine aerators in this review were samples. Question of the Day: What do you think of these results and of wine aerators in general?